Along with the rapid development of technology in modern society and the ever quickening pace of daily life, the importance of literature and the written word is often considered to have diminished as the emerging generations become less focused on it. However, evidence still exists that, even in today’s world, the value of literature remains profound, and it is simply a matter of enlightening and encouraging the younger generations to pursue the ancient tradition that is the written word. For many, the primary attraction of literature is the opportunity it provides to disconnect from reality and divulge into a different world. Within a book, it is possible to experience the utmost extent of danger, or the ultimate exhilaration of love, without leaving your chair. The danger is not real, but the emotion is, and, for that reason, literature can be most extraordinary. It grants the reader experiences that would, in reality, hardly be possible, and the exploration of different viewpoints in characters whose personalities are perhaps foreign to the reader helps to develop an open and stimulated mind. The fact that there is hardly any truth to fictional literature only makes its existence more important since it also allows both the author and reader to approach difficult or controversial ideas with more ease. Topics such as death, crime, war, and love can be explored in their entirety since no real-life damage is being caused. Words are a key form of expression, which is indicated in George Orwell’s acclaimed novel 1984. The idea of the development of “newspeak,” in which word choice in language is gradually limited, demonstrates the extent of damage linguistic restrictions could cause in society. For instance, the limitation of words such as “excellent” and “fantastic” to either “good” or “plus good” not only restricts the words themselves but the concepts and emotions they convey. This means that notions such as love, happiness, grief, and important principles that we as a civilization value gradually disappear. If there is no longer a word for “love,” how can we express it, let alone understand the concept? If no written records of the concept survive, how can we recall that it ever existed? In this way, Orwell’s novel highlights the absolute necessity of language as a form of expression. Another opportunity that literature opens up to society is the ability to keep the past alive. The fiction of authors that lived prior to us provides insight not only into the political and social issues that existed in their era, but the emotional and personal reactions people had to them that cannot be extracted from a history textbook alone. Of course, a textbook can explain the social restrictions of the Victorian era; however, Charlotte Brontë’s Jane Eyre shows the true pain and isolation of being an orphan and a solitary female at the time. Literature and language are also some of the few tools that have the power of immortality. 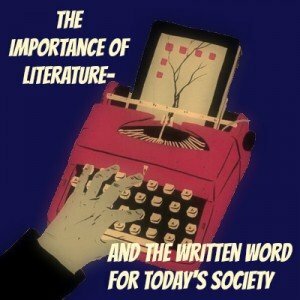 Thanks to literary record and the written word of previous times, past authors and societies are able to stay alive within the modern world, and we have the unique privilege of being able to learn from both their mistakes and their victories. Consequently, if we as an era intend to survive and continue to exist in future civilizations, it is vital that the tradition of literary writing continues, or else the details of our world as we know it will vanish into the void of time just as Orwell’s novel predicts. Victoria is a literary enthusiast from the United Kingdom, where she is currently studying her A-levels. She endeavours to read anything and everything she can get her hands on and hopes to pursue her interests in reading and writing at university.